Though you might not know it by name, the flushometer is a plumbing device you have no doubt seen, and probably used. As opposed to most residential toilets, which rely on a water tank and gravity to flush the contents of a toilet bowl, toilets employing a flushometer are tankless, and rely on the water pressure from the water source itself. Toilets with flushometers are most commonly seen in public restrooms and places of business. When the flushometer is activated, it releases a metered amount of water into the toilet, then closes back up. The single flush from the flushometer theoretically wastes less water per flush than a typical tank system because it cleanses the bowl with a lower-volume, higher-pressure stream. There is also no need for a tank, and therefore no refilling time between flushes. 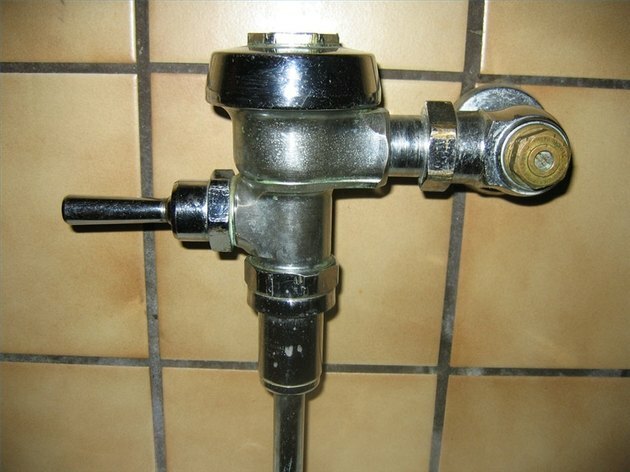 There are two basic types of flushometers---piston valves and diaphragm valves. In both systems, the valve is separated into a larger, high-pressure chamber and a smaller, low-pressure chamber, with the piston or diaphragm, located in between the chambers, being displaced when the flushing mechanism is activated. In each case, the water is released through the valve with the changing of pressure within the chambers. Essentially, the only difference in design lies in the use of either a rubber diaphragm or a molded cup (piston) between the chambers. The activation mechanism of the flushometer might be a lever, button or motion sensor, with a mechanical override usually installed alongside electronic models. Some older flushometers can be retrofitted with battery-powered motion-sensor triggers. However, in public restrooms it is not uncommon to find overly sensitive automatic flushometers that flush prematurely, often multiple times, thereby spoiling the potential water savings for which the flushometer was made. You can also find dual-flush models that provide two different flush volumes. Disposal of liquid waste requires less water than solid waste, so you can opt for a lower-volume flush as needed. The drawback to installing a flushometer is that it is not compatible with all plumbing systems. The toilet design itself has to accommodate a lower volume flush. An older tank toilet might require up to five gallons to flush, making a 1.6 gpf flushometer incompatible. Further, the water piping itself has to allow a water pressure of at least 20 to 25 psi for the flushometer to function properly, which is not usually possible with the 3/4-inch piping found in most homes. It was because of these drawbacks just described that William Elvis Sloan's first Royal Flushometer was not an immediate success. When Sloan founded the Sloan Valve Company in 1906, his new valve was clearly more efficient, but most customers were hesitant to overhaul the plumbing status quo. He sold just two units in two years before his breakthrough third year, in which he sold 150.